Anyone who wanders away from this teaching has no relationship with God. But anyone who remains in the teaching of Christ has a relationship with both the Father and the Son. This is our fourth time at the excellent online resource, Start2Finish.org which includes various blogs, podcasts and Bible study materials materials available on everything from a phone app to print. Today’s writer is Billy Alexander. (Be sure to click the links to read the referenced scriptures in full.) Click the title below to read at source. In the early years of this nation a group of Quakers formed what they called “The Society of Friends” who pledged to “disown any member who owned, bought or sold a slave.”1 But the Friends went even further and called for a boycott of any goods that had been produced by slave labor. By 1804 the society was defunct and a former member attributed their demise to allowing slaveholders to join. Their compromise killed their cause. Such killer compromises are not uncommon to any group. Many conservative political groups cite O’Sullivan’s law which states that institution that is not explicitly right wing will become left wing in time. Many Ivy League schools, such as Harvard, Princeton, and Yale began with the conviction that there is no true knowledge or wisdom apart from Jesus are now hostile to campus groups that maintain their institutions original charters. Just consider the devolution of the Boy Scouts political compromises over the last two decades to see how quickly such long standing organizations can lose their objective and be transformed by others who do not share their purposes. Of course, such killer compromises are not unknown to God’s people. The nation of Judah was led by the godly king Jehoshaphat (2 Chronicles 17:3-4) while their northern kindred had grown apostate and were ruled by the wicked king Ahab (1 Kings 21:25). Through the marriage of their children the two kings became allies (2 Kings 8:17-18, 2 Chronicles 18:1). For this reason, Jehu the prophet of God upbraided Jehoshaphat, saying, “Should you help the wicked and love those who hate the LORD? Therefore the wrath of the LORD is upon you (2 Chronicles 19:2).” Not only did this daughter of Ahab corrupt Jehoshaphat’s son, the entire nation suffered and she murdered all but one of Jehoshaphat’s heirs (2 Kings 11:1-2). Jehoshaphat’s agreement to serve with the idolatrous King Ahab was literally a killer compromise that nearly ruined his nation and almost eradicated his royal line. After returning from captivity a remnant of Jews returned to Jerusalem to being to rebuild city’s walls and temple. Having been persecuted strongly in their efforts a group of Samaritans approached them and asked to assist them, asserting that they served the same God (Ezra 4:1-4). On the surface this seems like a harmless request but Zerubbabel knew that the Samaritans worship of Jehovah had been corrupted by the introduction of idols so he refused allow them to collaborate in the Jewish mission to rebuild the city and her temple. As the governor of the people he stayed on mission and rejected their offer of a killer compromise. 1Crothers, A. G. 2005. “Quaker Merchants and Slavery in Early National Alexandria, Virginia: The Ordeal of William Hartshorne.” Journal of the Early Republic 25: 47-77. http://ezproxy.snhu.edu/login?url=https://search-proquest-com.ezproxy.snhu.edu/docview/220964217?accountid=3783. 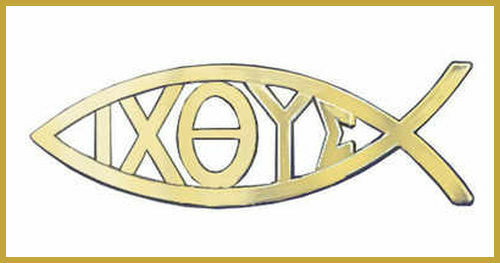 Unrelated: Would you be able to explain to someone what the fish symbol with the Greek letters (often seen on the back of cars) actually means? A few days ago at our parent blog, Thinking Out Loud, we took a few minutes to review the meaning of the ickthus or ickthys.